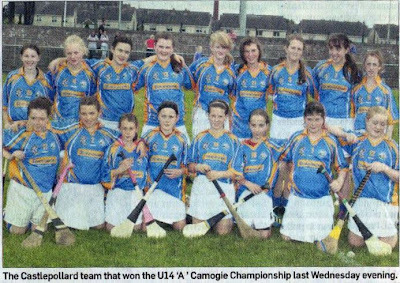 Scenes of jubilation in the Square in Pollard on Wednesday 27th June as the town's U14 camogie stars landed the "A" title with a classy win over Cullion in St Lomans Lakepoint Park. Long in the shadows of their neighbours in Collinstown, camogie in Pollard is back in a big way, and if the performance of starlets like Jane Nangle, Melissa Fivey, captain Niamh McCarthy and Melissa Nea are anything to go by, then the club's future is in safe hands. They won, however, only after resisting a fierce comeback attempt by Cullion who, trailing 2 - 4 to nil at the break, emerged a completely different team. Things looked bleak for Cullion after 1 - 4 from the impressive Nangle, aswell as a goal from Nea, and it might have been worse for Cullion without the defensive expploits of Sally Elsheikh and her colleagues. Cullion brought on a string of subs and one of these Megan Ennis raised a green flag, five minutes after the restart, but when Nangle notched up her 2nd goal with a fortuitous lob, the game looked all but over. Cullion kept battling though, and the skillfull Ennis netted a screamer on 37minutes, before completing her hat-trick six minutes from time. Mean while Cullion chipped in with 3 points to reduce the deficiet. 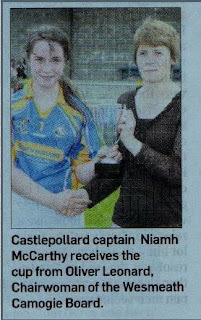 But Pollard weathered the gathering storm to win by six points, as skipper Niamh McCarthy received the U14 "A" trophy from Westmeath Camogie Board chairperson, Olive Leonard. Avril Kelleghan, Lauren Murray, Laura Kilcoyne, Melissa Fivey, Niamh McCartey(capt),Kreanna Carroll, Jane Nangle, Emma Walsh, Melissa Nea, Jade Crone, Saoirse Corrigan, Shannon Daly, Caitlin Devine, Kirsty Fivey, Laoise Devine.